On 2 March 1867, just 31 words tacked onto a Congressional appropriations bill gave the President of the United States the authority to commission Navy civil engineers, creating a new Navy staff corp. The Civil Engineer Corps, or CEC, received their commissions from the President like other naval officers. Yet the 8 men of the CEC couldn’t wear Navy uniforms or rank devices in the 14 years immediately following their creation. These newly created officers suffered from discrimination In the United States Navy rooted in the concept of “relative rank”. Line officers, those who sailed ships, jealously guarded military rank and argued staff officers receiving equal rank undermined morale, deteriorated discipline and were unsuited for leadership. Therefore, the Navy conferred “relative rank” on all staff corps officers. While corps officers “ranked with” corresponding line-officer pay grades, they held professional titles such as chief surgeon or assistant civil engineer rather than “line rank.” The CEC finally received authorization to wear rank in February 1881 in Navy General Order 263, and were authorized to wear Navy uniforms later that year. Between 1881 and 1921, the relative rank debate raged within the Navy and caused divisions between line and staff officers. Although the Naval Reform Act of 1899 abolished the formal use of relative rank, the idea continued to influence line officers. From 1871 until WWI, senior line officers, including influential Commanders George Dewey and Alfred Thayer Mahan, argued to maintain relative rank standards. Senior staff officers from all the Corps argued they – like line officers – deserved equal rank, professional respect and leadership opportunities. CEC and other Staff officers served their commanding officer and the Navy’s chain of command. Nearly one third of all Civil Engineer Corps officers are in this 1918 photograph, most of whom received degrees in Civil Engineering from Rensselaer Polytechnic Institute. Harry H. Rousseau became Rear Admiral at the age of 36 while serving as the temporary Chief of the Bureau of Yards and Docks – he remains the youngest RADM in the US Navy’s history. science degrees in order to sail modern ships, while the leadership skills of CEC officers like Mordicai Endicott, Robert E. Peary and Harry H. Rousseau positively influenced line officer opinions of staff officers. Modernization of the Navy continued during World War One. Only 5 days after the end of WWI, on 16 November 1918, the Navy eliminated uniform designations that segregated the staff corps, and established a single set of uniform regulations for Naval personnel. After 1921, all U.S. Navy officers wore the same uniform, wearing line and staff devices on the sleeve or collar that did not distract. This uniform change visually equalized line and staff officers. Ben Moreell with former Chiefs of the Bureau of Yards and Docks, all of whom dealt with issues of relative rank and engineering authority while Chiefs of both BuDocks and the CEC. In the back row, from left to right are retired Rear Admirals: Homer Stanford, Fredric R. Harris, Charles W. Parks, Luther E. Gregory, Archibald L. Parsons, and Norman Smith. Commander Ben Moreell advanced to the rank of Rear Admiral in December 1937, completely skipping the rank of Captain without using relative rank. During his tenure as Chief of the CEC, Moreell focused on the leadership skills of CEC officers, knowing that their technical skills were well established. In WWII, he fought for the CEC to lead the newly formed Naval Construction Force known as Seabees. Changing attitudes among line officers, and the WWII success of the Naval Construction Force, other Staff Corps and their enlisted forces, helped end any further discussions on relative rank by 1947. Today, relative rank no longer plays a part in the Navy. Each officer’s promotion is based on a selection committee’s determination of who is best and most fully qualified to fill available vacancies. This is especially true as an officer qualifies for promotion to the senior ranks, whether they are part of the line or corps. Leadership qualities and technical skill, core concerns of U.S. Navy officers over 150 years ago, merged and now strengthen today’s Navy. Seabees began construction on the first South Pole Station during the “Summer Season” of 1956-1957 – almost 20 years before their famous South Pole Dome. Early construction on Antarctica supported the International Geophysical Year (IGY), a first coalition of 39 nations committed to an 18-month systematic investigation of the Earth’s environment using the latest technologies. Along with seven ships from the Atlantic Fleet and an air wing with extreme cold experience, US Navy support of IGY – designated Task Force 43 – included a special unit of Seabees created to build-up the facilities required to do the science. Seabees were specifically tasked with constructing research facilities between the Ross Ice Shelf and the South Pole. Construction on the first Amundsen-South Pole station began in November 1956. Seabees faced unbelievably difficult conditions in Antarctica, which were amplified by the remote conditions of the South Pole. Common Seabee activities, such as transporting simple construction materials or maintaining a runway, became dangerous when crossing a frozen continent to supply the new Station. Seabees faced extreme weather, extreme cold, and extreme geographical features such as crevasses, as they sought to make the pole habitable. In order to keep Seabees safe while they completed construction, the Navy waived some their standard uniforming and grooming regulations. Seabees could wear almost anything that helped them to work comfortably in the extreme conditions. This included a wide variety of headgear, undergarments, wool shirts and “longer than regulation” hair and beards. In addition, special clothing was issued so that work parties in white out conditions could be easily located. Approximately 25 Seabees began construction at the station with Jamesway hut berthing – basically insulated arched tents based on a Quonset hut design. These temporary structures were almost immediately replaced with flat-roof prefabricated Clements buildings. Knowing that the original structures would be buried within years by blowing snow, a second story was added to many of these structures. These buildings, along with pitched roof buildings known as T-5 huts, were used until the iconic South Pole Dome replaced the original or “Old Pole” Station. The Amundsen-South Pole Station has been in continuous use since the first Jamesway hut was set-up by these intrepid Seabees. Officially commissioned and dedicated on January 23, 1957, the success of the Amundsen-South Pole stations that replaced the first are intricately woven with the Seabee spirit. Their “Can Do” attitude ensured operational stations remained in place since that first winter-over season of 1957, continuing long after Seabees departed Antarctica that final time in 1994. Becoming a Seabee Combat Warfare Specialist (SCW) is earned and is not a privilege. Earning a SCW pin is an amazing achievement in a Seabee’s career and is important to gaining access to other opportunities within the Naval Construction Force (NCF). The SCW program dates to a Master Chief’s conference in 1992, which concluded that the Seabee community should have a warfare designation to recognize the Seabees’ past accomplishments to the Navy. The SCW insignia pin features an armed Seabee over a crossed sword and rifle atop oak leaves. The silver insignia is for enlisted personnel and gold is for officers. To qualify to become a Seabee Combat Warfare Specialist is no easy task. To earn this pin the service member must complete Personal Qualification Standards (PQS) which include Seabee Combat Warfare volume I & II, Naval Construction Force 1&C, and Navy Safety Supervisor from the Navy’s Non-Resident Training Course (NRTC) website. In addition, the Seabee must be within physical standards, qualified with the M-16 rifle or M-4 carbine, and must be currently assigned to a unit of the Naval Construction Force. The Seabee must also take a written exam and a field exercise. Upon completion of all prescribed training, a “murder board,” committee of questioners who help someone prepare for a difficult oral examination, is usually held. Upon completion of the murder board, the final board which lasts about two hours is given. The boards are a way to measure confidence and gauge potential leadership within the Naval Construction Force. If nominees pass the board, they are given the title of a Seabee Combat Warfare Specialist. Seabees place heavy emphasis on tactical field training and basic combat skills. The Seabee Combat Warfare insignia expresses the motto of the Seabees, “We build, We fight.” Come see the SWC Insignia pins and many other Seabee related memorabilia at the U.S. Navy Seabee Museum. The U.S. Navy Seabee Museum is proud to collect and exhibit treasures from around the world that Seabees have accumulated during their time in service. Many of these objects are souvenirs or gifts handcrafted by locals all around the world, some extremely unique. Two of these artifacts in the U.S. Navy Seabee Museum collection come with the story of the Seabees working abroad with the U.S. Department of State. The Seabees from the Naval Support Unit provide support to the Department of State security program on a continuing basis. Seabees perform construction, renovation, maintenance, and repair work in the secure spaces at U.S. embassies around the world. Most of these tours of duty are 3-4 year assignments. In the late 1960’s Senior Chief Builder (BUCS) Theodore R. Roff, Jr. was a Seabee assigned to work with the State Department in the city of Belgrade, Serbia, formally part of the Yugoslavia. During his time in Belgrade he purchased two magnificently handcrafted copper reliefs, malleable metal shaped by hammering from the reverse side to create a raised design. These reliefs are solid copper and were crafted by an art teacher who taught at a local school in Belgrade. The artist’s name has been long since forgotten by its original owner. 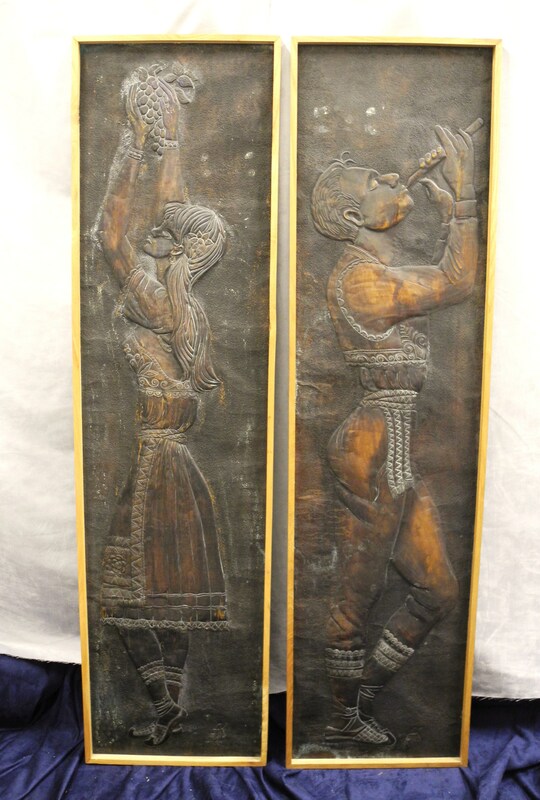 These copper reliefs portray a man and a woman, both in traditional dress of Yugoslavia. It was not uncommon to see rural women in traditional working clothing all the way up to the end of the first President of Yugoslavia, Josip Tito, term in office in 1980. Today, these traditional clothes are mostly worn by elders in rural areas, on national holidays, and as part of celebrations, tourist attractions, and displayed in museums. The woman in the relief is depicted collecting grapes. This may speak to Yugoslavia’s rich history of viticulture and production of wine, dating back to before Ancient Roman times. The former country of Yugoslavia was among the top wine producing countries before it was dissolved into 6 countries in the early 1990’s. The man is shown playing a traditional Serbian flute known as a frula. The frula is a small wooden flute with six holes and was played by shepherds while tending their flocks. It was also used for leisure times, traditional, or to accompany the kolo (circle dance). Seabees don’t only bring home unique collectibles from their time abroad; they bring home stories of different cultures and traditions to be shared. 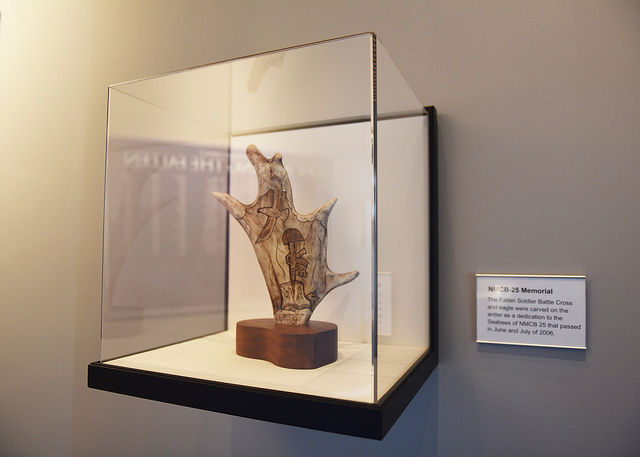 Visit the U.S. Navy Seabee Museum to see the many other pieces of art and gifts Seabees have donated. Have you ever thought about donating heirlooms to a museum? Have you cleaned out your attic or a family member’s home and come across scrapbooks, photographs, uniforms, or other memorabilia you think a museum may be interested in? Museums are the gatekeepers of the past, the interpreters of history, and the conservators of historical artifacts. 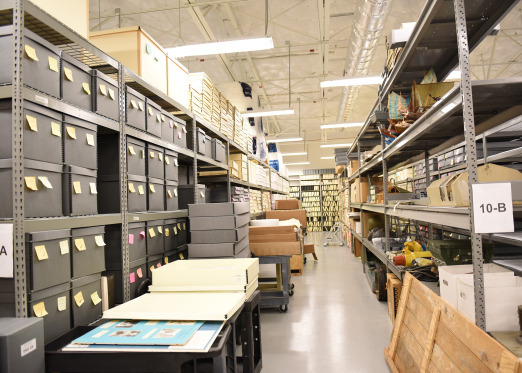 The U.S. Navy Seabee Museum’s mission is to collect, preserve, and display historical material relating to the history of the Seabees and the Civil Engineer Corps. We cannot fulfill our mission without donations and no one wants to come to an empty museum. The artifacts and archives bring history to life. 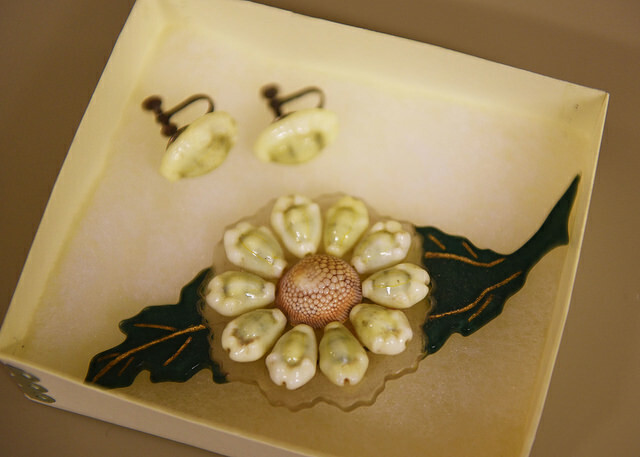 Trench art jewelry fashioned out of Plexiglas from a downed Japanese aircraft donated to the U.S. Navy Seabee Museum by a Seabee who was assigned to the 51st Naval Construction Battalion which operated near Saipan during WWII. Why donate your heirlooms to a museum? There are many reasons to donate your heirlooms to a museum because they have a historic or regional significance, relate to a significant person or event, and offer resources for future researchers. Preservation is also another reason why people donate their heirlooms. Museums provide housing for artifacts through climate controlled storage facilities and safe environments away from sunlight damage, daily wear, and mold contamination for future generations to enjoy. If the items you are considering donating are not your own, it is recommended that you discuss your intentions with all family members prior to donating your relative’s memorabilia to a museum. It is important that everyone is in agreement. Once the decision has been made to donate items to a museum, the next step is finding the right institution for your objects. Museums have different missions and themes. Museum types vary including: history, natural history, science, or children’s museums. It is important to find a proper institution where your heirlooms will be safe and appreciated. Think locally for your heirloom’s new home and visit near-by museums to discuss donation potentials. The U.S. Navy Seabee Museum is under the Naval History and Heritage Command (NHHC). This Command oversees 10 Navy museums around the country with the shared mission to collect, preserve, protect, and make available the artifacts, documents, and art that embody our naval history and heritage for future generations. At the U.S. Navy Seabee Museum, we consider all donations that relate directly to the U.S. Naval Construction Force and the Civil Engineer Corps. If you or your relative were a Seabee, CEC Officer, or were directly associated with them, we would be happy to consider your donation. Letters written by a Seabee to his wife back home during WWII. These were donated to the Seabee Museum by a Seabee’s relatives. Before contacting an institution about your potential donation you need to gather the item’s story, we call that provenance. In the museum world the word provenance refers to an object’s history, who owned the object, when and where, and any other information on the object. Objects alone may have historical value, but the stories that accompany the object bring them to life. We need to know as much information on the Seabee or CEC officer. For instance, which battalion they served in. If you do not know the answer, the national archives have made it easier for you to request Military Service Records by visiting their website at http://www.archives.gov/veterans/military-service-records/. We also capture oral histories, documentation proving the item’s authenticity, letters, journals, diaries, photographs, record of importation, manufacture, or sale, and legal documents like deed or wills. Once you have chosen a museum, call to find out who handles the donations, most likely it would be a curator or registrar. 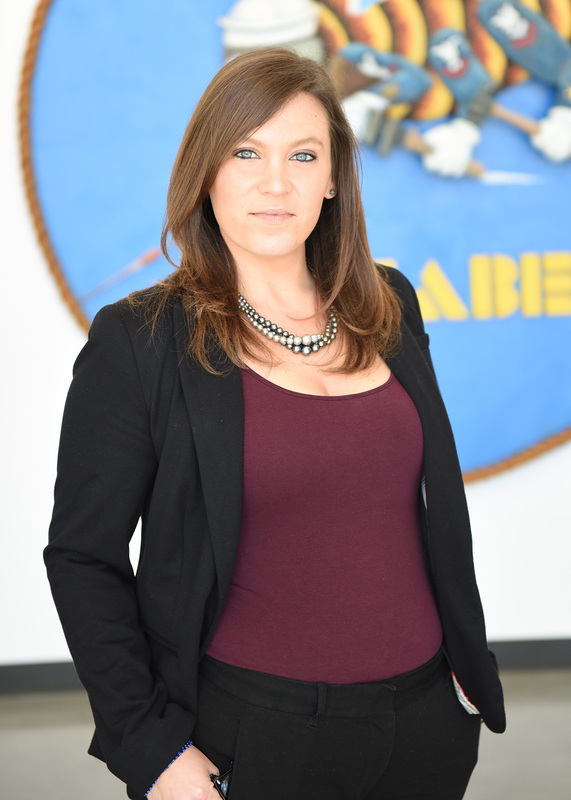 At the U.S. Navy Seabee Museum, the curator is responsible for accepting new donations. I can be reached by telephone at 805-982-6191 or by e-mail at robyn.king1@navy.mil. We ask that you contact the museum before you drop off any donations. They will not be accepted as walk-in donations. I will ask you to describe the item, its history, and why you think it belongs in the museum. If it is of interest to the museum, I will then ask to see a photo of the object to see its condition. Each donation is presented to the Museum Collection Committee who ultimately decides to accept the donation or not. The museum may take temporary custody of the item while it makes its decision. This process usually takes 3 months due to our current backlog. You will be notified if your object was selected to be included in our collection. If the Seabee Museum accepts your donation, the paperwork is simple. You sign an official Deed of Gift form and your heirloom becomes property of the Department of the Navy. If your donated item has a copyright, this process will be further discussed with our archivists at that time. After you have transferred ownership, the Director of NHHC at the Washington Navy Yard must accept your donation to the museum. This may take a few weeks to process. Once the Seabee Museum receives back all appropriate paperwork we will then accession (accept your donation into the Seabee Museum Collection), catalog (individually number each object), photograph, and prepare the object for exhibition or storage. Your name, as donor, will be linked to the donated items in the collection database. If the item is included in an exhibition, museum staff might have to do additional research on the object. Fallen Soldier Battle Cross and eagle hand carved onto an antler as a dedication to the Seabees of NMCB 25 that passed away in 2006. This was donated to the U.S. Navy Seabee Museum and currently on exhibit in the Hall of Heroes. Is your donation guaranteed to go on exhibit? The simple answer is no. It may never go on display. Only about 2% of a museum’s collection is on display in the museum at any given time. 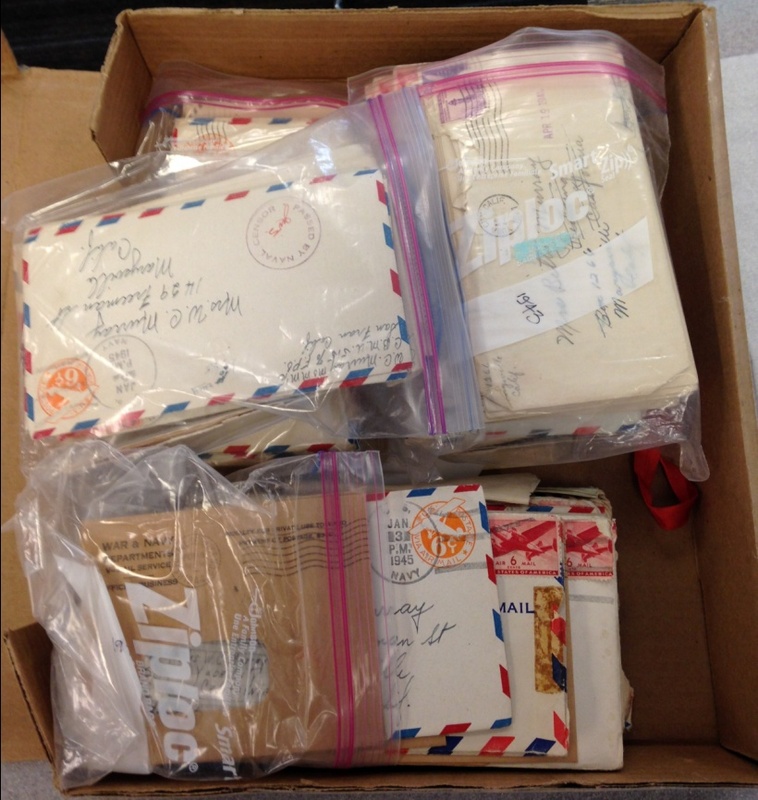 The majority of collections are in storage for preservation and to be studied by scholars and researchers. No matter how much your heirloom means to you, it may not be right for the museum. It might be declined because it is in poor condition, or it does not fit the Seabee Museum’s mission, falling outside the museum’s scope of collection or the museum already has similar items. Every museum has storage and capacity issues. We cannot accept every donation and have collecting priorities. If our museum collection is unable to accept your donation, you may have the option to donate it to our education department for learning purposes. If the Seabee Museum declines your donation, consider offering it elsewhere. Local maritime museums collect navy related artifacts; state archives collect diaries, letters, maps, photographs and some artifacts; and the NHHC has 9 other museums that may be interested in your donation. The donation process is a detailed process, mostly done behind the scenes at a museum. With your help and knowledge of your items, together we can work together to make the process as smooth as possible. By contacting the museum first, we can tell you right away if your donation is something we may be interested in acquiring and go from there. The entire processes from start to finish may take about 3 months. You will receive a thank you letter from our museum director showing our appreciation and gratitude. Your donations help our museum fulfill its mission to collect, preserve, and display historical material relating to the history of the Seabees and the Civil Engineer Corps. Please consider donating to the U.S. Navy Seabee Museum if you think you may have objects relating to the Seabees and the Civil Engineer Corps. I look forward to speaking with you over the phone to start the donation process! 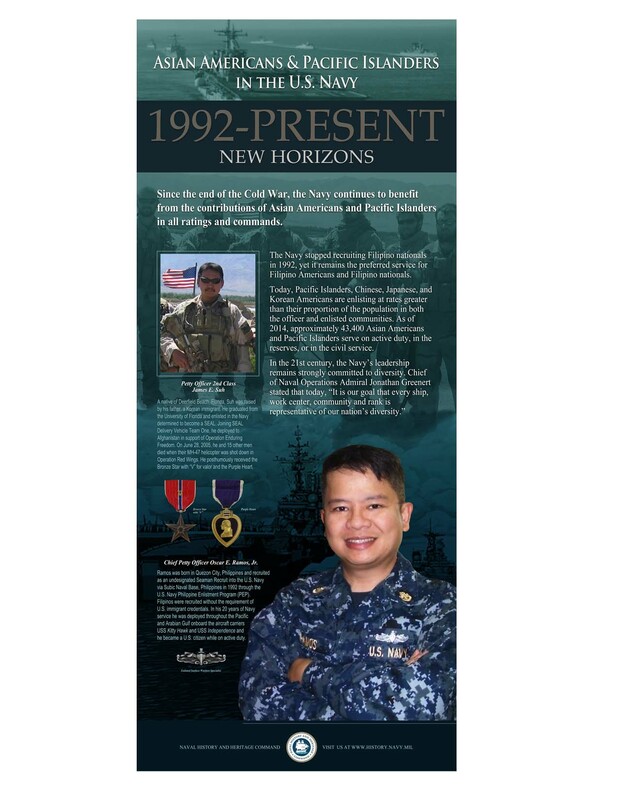 While the Navy ceased recruitment efforts specifically targeting Filipino Americans, it remains the top service of choice for them and Filipino nationals. Throughout the current century, they have contributed to the all-inclusive, all-volunteer Navy, making it one of those powerful navies in the world due it its multi-cultural diversity. In 2014, more than 43,000 Asian and Pacific Islanders served on active duty in the Navy. While we conclude our Asian and Pacific Islander presentation, we would like to invite you to our formal presentation with special guest speaker Susan Ahn Cuddy, former Navy lieutenant who was the first Asian American woman to serve in the Navy when she joined the Woman Accepted for Emergency Services (WAVES) during WWII. The speaking engagement will be Saturday May 9, 2015 at 10 a.m. in the Seabee Museum Main Education Room. Explore our parent command, Naval History and Heritage Command‘s historical presentation: Asian and Pacific Islanders. For non-military presentations, visit the official website for Asian and Pacific American History Month.